Want loose pearls or individual pearls single by piece, or on loose strands? Pearl sizes: from very small 1mm seed pearls or baby pearls to large pearls that are 35mm or larger real pearls, from freshwater pearls, to Tahitian loose pearls, to south sea shell single pearls. 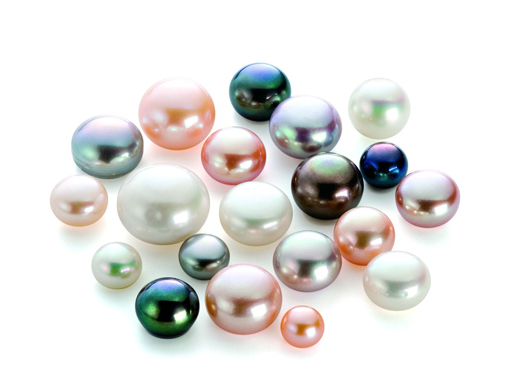 Pearl colors: from natural white, pink, mauve to processed color in red, champagne, black, green, gold, chocolate, brown etc. Pearl shapes: from round pearls, drop pearls to button pearls, biwa pearls, coin pearls, cross-shaped pearls to baroque pearls to Keshi pearls to mabe pearls, etc., in any shape. Undrilled pearls: also called keepsake pearls is sold as a single pearl or individual pearl, in all sizes and shapes. Check out loose or individual pearls, or have them half drilled for your settings to make your own pearl jewelry. Drilled pearls: we have pearls drilled in any sized holes, and anyway that you would like, from fully drilled, top drilled, double drilled, side drilled, half drilled to center drilled or double drilled. Check out our loose pearls on strands and they can be drilled to any SPECIFIC WAY YOU WANT. Drilled Hole Sizes: We have pearls that have holes already were pre-drilled in various sizes (from 10.7mm, 1.7mm, 2mm, 2.3mm, 2.5mm, 3mm or even larger holes) for your jewelry making needs. Quite a few of the large hole pearls and bead are in stock and ready to be shipped immediately from our San Diego, USA office. Just check out from the unfinished jewelry section for any specific shape of the pearls you like. Need your pearls to be custom drilled, or half drilled? Or drill larger hole sizes you specify? Pearl Drilling- we Custom Drill Larger Hole Sized Pearls or Beads: Usually 0.7mm is the regular sized holes. If you like any pearl strands or bead in our unfinished jewelry section to be drilled with bigger holes for leather cord, lace or ribbon, you can use our special pearls drilling service and have the pearls custom drilled to 3mm or larger hole sizes. However, please note pearls need to be large enough and also allow an additional 2-3 weeks (although padded with extra time) to get the pearls specially drilled in your way, at any bigger hole sizes you specify. Half drilled pearls are also usually used for making pendants, earrings, rings etc., or just for keepsake by putting the pearls in a pearl cage. We have all types of half drilled pearls from drop pearls to button pearls, to coin pearls, to round pearls, to flat coin pearl, to rectangular biwa pearl, to square Keshi pearl etc..
Use loose pearls as a gift to yourself or someone you love. An undrilled single large pearl makes a great gift for an anniversary or a bride-to-be. The most popular one that we have been selling is a completely round 9-10mm large pearl with the highest grade that you can find. Find all loose individual pearls here. Make it a complete fine piece of pearl jewelry, get a pearl cage here to keep your treasured pearls. Other sizes, shapes, and colored pearls are also available for special orders. Please call for detailed information. For pearl colors, we almost always have white, pink, and lavender colored pearls in stock unless temporarily sold out due to a large quantity order which will be back ordered right away and get back in 2 weeks or so. As long as you have a quantity of 50 and about 2 weeks of time, we can process red, green, blue or any colored pearls for you. The reason we can not process the quantity less than 50 strands is because the color can not be guaranteed coming out correctly as there will not be enough strands to make them evenly.